Le Beaujolais Nouveau est arrivé! Beaujolais Nouveau 2015 has arrived! Beaujolais Nouveau is a wine made from Gamay grapes produced in the Beaujolais region and released on the same year of its harvest. Every year in France, is released on the third Thursday of November and French people gather in restaurants and bistros to celebrate it. Any excuse to drink some wine and have some fun really! 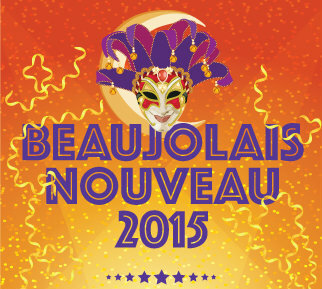 So come along on Thursday 19th of November from 6pm to celebrate Beaujolais Nouveau like in France. Under the heated, covered terrace of La Maison you can have a glass of Beaujolais Nouveau for just €5 and enjoy some complimentary French nibbles. I’ll make sure you feel as if you are in a French bistro with a little bit a French music and a casual atmosphere. No booking required, just pop in!